European emission laws have had a huge impact on both the type of vehicles we drive and the automotive aftermarket in recent years, with the move towards low pollution vehicles seemingly unrelenting. Car manufacturers in particular will often question if more stringent regulation is really necessary, so to see what Europe could resemble without emission regulation, it is interesting to take a look at the current situation in China. 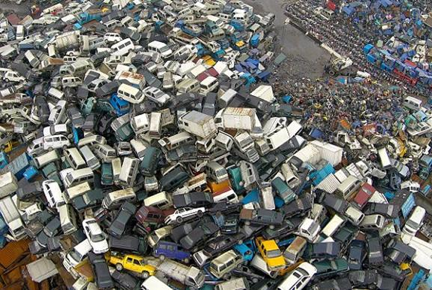 Currently China is having a massive crack down on high-emission vehicles, which has seen scrapyards full to over following and cars, trucks and even buses simply abandoned at the roadside. The reason behind the move is cities choking on smog mainly produced by vehicle exhausts. The World Health Organisation says that the air in the capital, Beijing, is 20 times over the air pollution limit considered healthy by doctors, while in the city of Hangzhou in 2013, 239 days of the year were severely affected by smog. Rising car ownership is a big contributor to the problem and the government is now implementing carbon-cutting target for car makers while forcing the biggest polluters off the road, resulting in huge vehicle numbers entering the recycling system. China is now essentially playing catch up with the EU and America on vehicle emissions and the damage the issue has done to people’s health in the country is un quantifiable. It would seem that perhaps the drive for cleaner greener vehicles is one area where the much criticised European Union has got it right.